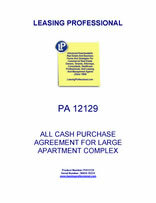 This form is a real estate purchase contract for a large apartment complex, where the buyer assumes the existing financing on the complex and pays the balance of the purchase price in cash. The purchase agreement contemplates a 45 day feasibility period during which the buyer conducts due diligence for the purchase. The seller must furnish detailed property materials for the complex to the purchaser within a specified number of days following the signing of the purchase agreement for evaluation by the buyer. 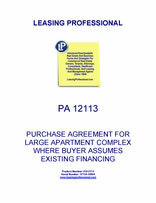 The purchase agreement provides for the assumption of the existing financing on the apartment complex by the purchaser. Such assumption will require the purchaser to file an application with the lender to assume the existing debt, to pay all applicable fees, and to provide all applicable documentation required by the lender. The purchase contract also requires the existing lender to expressly release the seller following the assumption of the existing loan by the buyer.